Think about this for a minute. “Moses’ and Aaron’s perspectives on the difference between the special sacrifices of the day and those that would be offered up on a regular basis reflect their emphases in our relationship with G‑d. Moses was devoted to transmitting G‑d’s Torah to the people, whereas Aaron was devoted to elevating the people to the Torah. 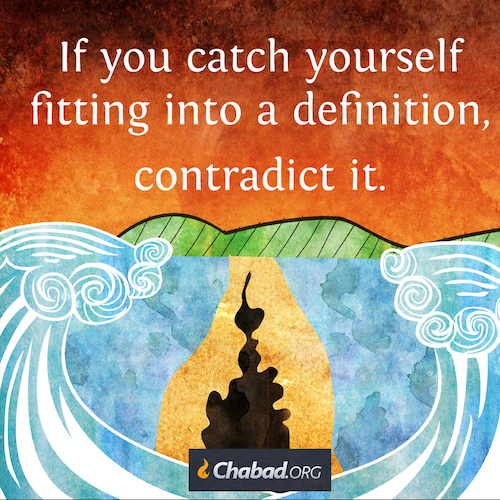 The Torah is unchanging truth, whereas human beings are constantly changing. Moses saw the Torah’s truth as being uniformly applicable in all situations, whereas Aaron realized that each situation must be assessed in order to know how to apply the Torah’s unchanging truth effectively. Aaron saw that a one-time sacrifice is different than one that would be offered up regularly, that G‑d’s truth can be reflected differently in different contexts. In our own lives, we must meld Moses’ and Aaron’s perspectives. For ourselves, we must be like Moses, devoted to the Torah’s absolute and unchanging truth. When interacting with others, we, like Aaron, must take into account their moods and inclinations, drawing them closer to the Torah through forgiving love.1 Likutei Sichot, vol. 17, pp. 113–116. “Moses assumed that G‑d’s instruction that the priests eat their designated portions of the day’s sacrifices applied to all the sacrifices of the day, while Aaron assumed that it applied only to the special sacrifices that were offered up on this day. When Moses saw that Aaron and his sons had not eaten their portions of one of the regular sacrifices, he demanded an explanation. When Aaron explained his perspective, Moses agreed that he was right.